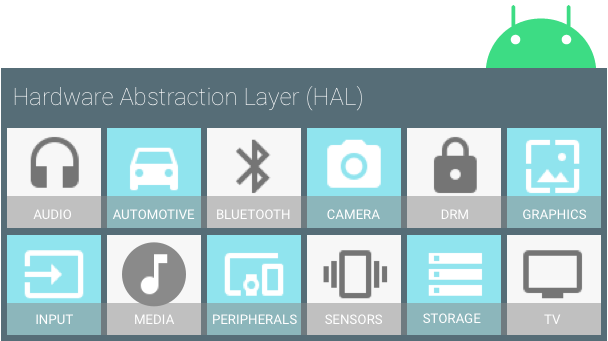 A HAL defines a standard interface for hardware vendors to implement, which enables Android to be agnostic about lower-level driver implementations. Using a HAL allows you to implement functionality without affecting or modifying the higher level system. This page describes the older architecture, which is no longer supported as of Android 8.0. For Android 8.0 and higher, please see HAL Types. You must implement the corresponding HAL (and driver) for the specific hardware your product provides. HAL implementations are typically built into shared library modules (.so files), but as Android does not mandate a standard interaction between a HAL implementation and device drivers, you can do what is best for your situation. However, to enable the Android system to correctly interact with your hardware, you must abide by the contract defined in each hardware-specific HAL interface. To guarantee that HALs have a predictable structure, each hardware-specific HAL interface has properties defined in hardware/libhardware/include/hardware/hardware.h. This interface allows the Android system to load correct versions of your HAL modules in a consistent way. A HAL interface consists of two components: modules and devices. A module represents your packaged HAL implementation, which is stored as a shared library (.so file). The hardware/libhardware/include/hardware/hardware.h header file defines a struct (hw_module_t) that represents a module and contains metadata such as the version, name, and author of the module. Android uses this metadata to find and load the HAL module correctly. A device abstracts the hardware of your product. For example, an audio module can contain a primary audio device, a USB audio device, or a Bluetooth A2DP audio device. In addition to these standard properties, each hardware-specific HAL interface can define more of its own features and requirements. For details, see the HAL reference documentation as well as the individual instructions for each HAL. HAL implementations are built into modules (.so) files and are dynamically linked by Android when appropriate. You can build your modules by creating Android.mk files for each of your HAL implementations and pointing to your source files. In general, your shared libraries must be named in a specific format so they can be found and loaded properly. The naming scheme varies slightly from module to module, but follows the general pattern of: <module_type>.<device_name>.